My beloved lil girl is SUCH a mini me!! I love being mom and though allll of our kids stretch me, sheeee really, reallllly grows me! Being a mom is far from a quick rewarding job. We are not often given praise or gratitude for allll that we do. I feel, on many days, that I run a race on a wheel. Crafting is my meeee time! Thank God for His Grace and that he gave me stamping as an outlet. Our lil angel wrapped up her first year at elementary school and is preparing for 1st grade (eek!). Her teacher, whom I'm blessed to call a friend, makes these huge books for all her students (my son still looks thru his!). LOOK (!!) at the cover. 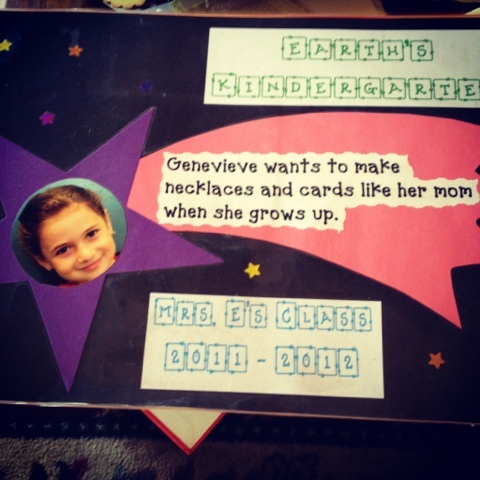 This was Genevieve's first day at school and this touched my heart sooo much! It's moments (rare at times) that make being a mom and all of our sacrifices so that I can be in her life full time worth while. Blessings y'all!! I sure am! Thanks Melissa - Love Stampin and telling others about it!